"Vulkar's Portal" tells a story where Hemiko finds a glitched portal, dragging her back in time into the days of minecraft alpha/beta. With no understanding of why this portal was part of her house on a server, she met Shareen16, a minecraft player loving the joys of adventure, tries to help Hemiko figure out the origins of this mysterious portal. However Hemiko was about to witness a far more bigger event than a small glitched portal. Hey! Thank you for your interest in this! I've been writing this for a short while now and I hope to make it a reality and animate this in my spare time! People know me as Hemiko - I'm massively creative and like to think I can help whenever I can! - Patience. Animation isn't easy, and it wont happen in a day. If I feel you are being rude to me or fellow cast members I have full rights to remove you from the movie. - Casting closes 13th December 9PM GMT! 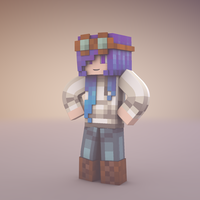 Shareen is a miner, and loves exploring the caves for ores and treasures. She's seeks adventure but is always stopped by her mother. Shes strong and loves the thrill of exploration! But sometimes she can be stubborn and will stop and nearly nothing to get something if she wanted it bad enough. "You look...strange. What part of Minecraft do you come from?" "Mom, I can look after myself! I''m going to find out what happened to those miners on my own!!" "Okay, this was more than we bargained for!! RUN!" 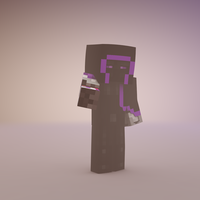 EnderEye is a character with a hidden identity, with a wish to find a way to erase the future doings of minecraft to make way for his own visions. He stands at nothing to get what he wants but can be impatient and demanding of others. "They'll grant my wish, don't you worry, Neriko. They will find that portal...and we will use it to erase the future of this realm!" "Shareen?! The fence gate is open again!!" "Ahhhh, what a lovely morning it is! And not a zombie in sight!" Although Neriko is quite shy, he is EnderEye's assistant and is very clever. He's pretty much a scadey cat. "This w-wasn't supposed to happen. EnderEye!? W-W-What are we going to do?!" " *Sigh* Now I need to find more Iron..."
This character is a friend of Shareen. She loves exploration just as much and is keen to learn about the minecraft world. "Shereen! There you are! Where were you?!" "Future minecraft?! I can't believe it! Oh oh! Is there new biomes....or maybe even mobs, dimensions...how about dungeons?!" "Yeaaaaah...no. I don't know what you're talking about..."
There are some mixed roles where characters will appear or say one or two lines during the movie and thats it. No limit on these, if I feel your voice fits a small character, I will assign you to one. "So, Miss HemikoWay...know anything about mining? Since you know... *sarcastic* you look well equiped to go finding ores"
"Come and get your fresh flowers! Fresh Flowers here!" No lines for this one, I just need some characters to appear in the background, so feel free to leave your minecraft in-game tags (pc prefable) to be a extra!